The Government's budgetary balance until September 2018 registered for the first time a surplus of 1111 M€, which corresponds to 0.7% of the CGP generated in the period. This result already includes the negative net impact on the balance of temporary measures of 784 M € (or 0.5% of the GDP of the period) and reflects a performance of the third quarter without parallel in the quarterly statistical series published by the INE since 1995. The primary balance, which excludes interest charges, amounted to 6320 M € until September, which constituted another historical maximum in the statistical series available since 1995. This result reflects an accumulated homologous improvement of 1493 M € extending the trajectory of primary surpluses observed since the 3nd quarter of 2015. During this period, the revenue of the public administrations recorded an accumulated homologous growth of 5.4%, above the estimated by the Ministry of Finance to 2018 (of 4.9%). The annual growth rate of expenditure increased from 3.0% in the 1st semester to 2.3% in the first three quarters of 2018. This behavior of expenditure until September was about half of what is implied in the most recent estimate of the MF for the whole of the year (4.4%), having benefited from the change in the payment model of the Christmas allowance. 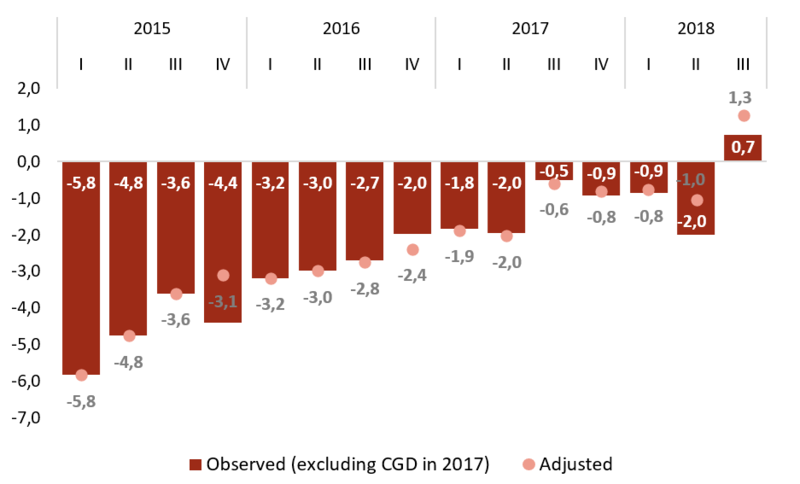 The budgetary developments until the end of the 3rd quarter and the information in public accounts already available (October and November), albeit incomplete, point out that the deficit in 2018 should be below the most recent estimate of the Ministry of Finance (which points to a deficit of 0.7% of GDP) presented in the Stability Programme 2019 and in line with the estimated by CFP in September (deficit of 0.5% of GDP). Source: INE. CFP calculations. | Note: The adjusted data correspond to the values of the observed balances expurgated from the effects of temporary measures and non-recurring measures as shown in Table 11 of the report. However, this estimate assumes the absence of significant changes in the mechanisms of public financial management and only considers the partial recovery already recorded of the guarantee provided by the State to Bnco Privado Português. To be verified, the full recovery of that guarantee would entail an additional favourable impact of 0.1% of GDP. The public debt ratio remained at 125% of GDP, as a result of the nominal value of the debt in the 3rd quarter equal to the nominal GDP (0.9%). Despite stabilization, the debt ratio remains above the successive forecasts of the MF for the totality of 2018. The available information indicates that in the last quarter of the year the ratio of GDP will resume a downward trajectory in convergence with the latest estimate of the MF. The achievement of the MF estimate (121.2% of GDP) implies that, in that quarter, the public debt ratio has reduced 3.8 p.p. of GDP. In annual terms, the achievement of this goal means a reduction of 3.6 p.p. of GDP, a value that compares with the estimate of debt reduction at 3.4 p.p. advanced by the CFP in September, which would put the debt ratio at the end of the year 2018 (121.3% GDP) practically In line with the estimation of MF.